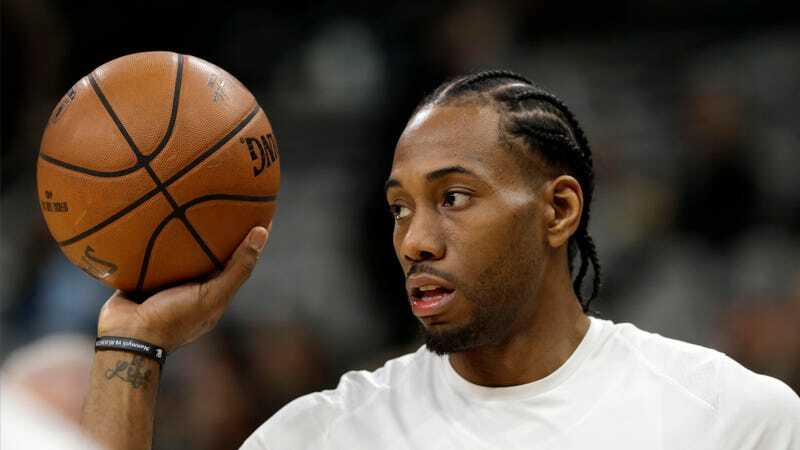 We know now, thanks to ESPN’s Adrian Wojnarowski, that Spurs doctors have medically cleared Kawhi Leonard to return from the quad injury that has kept him out all but nine games this season. So the decision to return is all Leonard’s, but head coach Gregg Popovich said yesterday the Spurs don’t expect him to be back this year. This is, as you’d expect, causing some internal strife, even on a team that’s generally pretty drama-free. The injury, rehabilitation and timetable for a return has complicated the Spurs and Leonard’s relationship, causing tension and fraying the fabric of what was once a strong partnership, league sources told ESPN. The uncertainty surrounding this season — and Leonard’s future, which could include free agency in the summer of 2019 — has inspired a palpable stress around the organization, league sources said. The Spurs sit third in the West and are playoff-bound with or without Leonard, but they’re almost certainly not real challengers to the Warriors without him. But even more important might be Leonard’s looming free agency; he has a player option for 2019-2020, and is a pretty safe bet to opt out. According to ESPN’s sources (who are obviously in the Spurs front office, so take what they say with that in mind), Leonard hasn’t returned because he hasn’t decided he can “play through the discomfort of the injury.” That might mean merely pain, and it might also mean Leonard is concerned about reinjuring himself—the last thing he wants heading into his showcase season before seeking a max contract. This is a business, and what employer and employee (or even two different employees, say, Leonard and Popovich) want doesn’t often intersect. Popovich, a notoriously player-friendly coach, gets this. His comments yesterday were matter-of-fact and blame-free. He keeps in-house what needs to be in-house, and seems to have a way of being able to smooth over anything that arises. (LaMarcus Aldridge went from demanding a trade this summer to having his best season as a Spur, for one example.) I don’t doubt that even if Leonard doesn’t return until the fall, his relationship with his coach, at least, will be none the worse for wear. Did Phil Jackson Leave This Flirty Note In A Cabin?